If you’re into indie games or are especially nostalgic for old school JRPGs, you’ll want to pay special attention to this story trailer for America Dawn. This freeware game takes place in Colonial America, and follows a character named Rarascau through the course of the Revolutionary War. Rarascau is a Keeper, a race of spiritual beings who assume human form in order to protect the mortal world. His alien nature grants him an extended lifespan, through which players will watch long stretches of American history. The game takes a somewhat educational approach to this, like a strange but not unpleasant blending of Suikoden and The Oregon Trail. Read on to learn more, and check out the video after the break. Unlike many RPGs, this game features no magic system; instead, each class is based on a historical unit (militiamen, dragoons, fusiliers, etc.) and uses abilities related to their role in the army. For example, a dragoon will ride offscreen on horseback for a round then charge back into the fray to deal extra damage on his next attack. 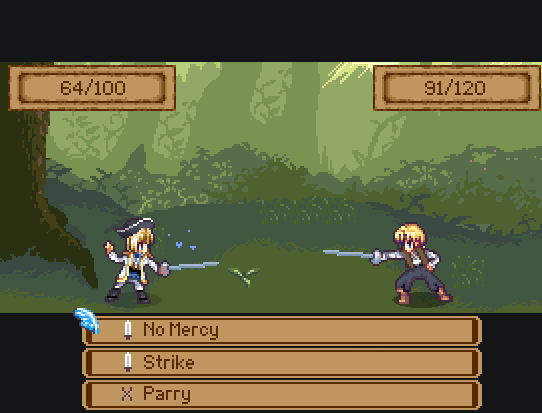 The game also features one-on-one duels, inspired by those in Suikoden. Americana Dawn is set to drop this winter, but a demo will be released — quite appropriately — on the 4th of July. If you like what you see in the trailer, you might also consider pitching in on the game’s kickstarter page so these nice folks can get paid for their work.